Gibus specialise in freestanding and leaning retractable terrace covers. Manufactured in Italy, Gibus have been committed to creating, marketing and using products that are made for people, because, first of all, the Gibus staff use the products and know how they would like them to be; safe, guaranteed, beautiful, functional and avant-garde. This makes Gibus terrace covers the obvious choice. Med Room- Create an outdoor room for all year use. Different PVC fabrics are available, the FLY, PLANA or MAKI, with blackout or anti-UV ray benefits. The curved fabric eliminates the need for the higher profile needed to accomodate a sloped roof, ensuring a slimmer and smaller top profile. The Zenit can be optionally equipped with zip closure blinds, and the Azimut comes with integrated screens. 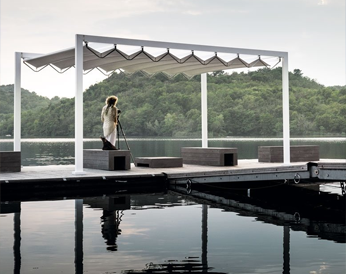 The functionality and flexibility of the Gibus terrace covers range provides various options of small, medium or large outdoor covered areas for domestic or commercial use. The high quality aluminium profile sections provide the basis for a structure which can be built to suit your needs with an all weather retractable roof in various forms, retractable blinds or sliding glass doors to the sides, LED lights under the roof, or on the framework, halogen heaters for keeping off the chill, and so on. Create your perfect outdoor oasis for all year round entertainment and living, whatever the weather. All systems are made to order and normally delivered within 5- weeks of order approval. Samson Awnings will survey, provide options and drawings for any planning and install all the Gibus systems almost anywhere in the UK.